How School Shirts work at Gilbert-American :: School Shirts and Uniforms, Custom T-shirts. Select your artwork from our extensive collection. We will customize your choice with appropriate colors and wording. Then, we will post your customized proof to our website for your review. Once the design meets your approval, and you have Emailed or Faxed your signed approval, you are ready to move on to step two. Once you've approved your artwork, you're ready to place your order. There are two methods you can use... If you know how many items you need, you're ready to order! If you wish to take orders, we will provide you a Master Order Form at no additional charge. Order forms are a great way to make sure you don't over order. Plus, you can collect payment from those ordering in advance. This makes it easy to cover the cost of your order with no out-of-pocket expense. 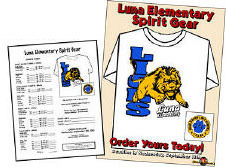 Once all of the order forms have been returned to you, you will add up your total for each size. Now you're ready to order. Now that your order has been placed we'll get busy and have your order ready to ship within 10 working days. When you place your order you will receive an invoice via e-Mail or fax. Please keep in mind that firm payment arrangements must be made before production can begin. We accept Purchase Orders from Public Schools, US Military and certain other qualified organizations on a case-by-case basis. For more information on our payment options, click here. We can also create artwork from your sketch, description, or camera ready files. For more information regarding new designs and camera ready artwork, click here. "Thank you so much for the shirts! They looked great, and the kids really enjoyed them! I will definitely use your company for any t-shirt purchases in the future!"